Enterprise Architecture | IT consulting, systems integration, custom applications, Kimball, database design and data conversion, legacy integration, Enterprise Architecture | Estrada Consulting, Inc.
Making your business more agile and able to adapt changes through Enterprise Architecture. Today, enterprises are operating in an extremely dynamic and challenging environment, which threatens the traditional business model. They have recognized the need to innovate faster and leverage foundational and disruptive technologies such as cloud, automation, machine learning, and artificial intelligence (AI) to deliver quicker results in a less disruptive manner. Enterprise Architecture (EA) is the enabler and change agent to help them undergo this transformation. all changes to either business or technical environments, no matter how small, must be aligned with the direction the business is heading. The Enterprise Architecture team at ECI help clients define and develop all aspects of their enterprise initiatives for the incremental achievement of targeted outcomes through enhanced business capabilities. ECI’s enterprise architecture helps organizations identify business processes that execute or support an organization’s mission and defines how Information Technology (IT) assets directly enable those processes. This allows executives in charge of business and IT transformation to foresee the impact of their decisions and plan the right actions at the right time based on actionable deliverables. We believe that the increasing pace of change in business requires continuous improvements in enterprise architecture to deliver greater business performance and support your organization’s transformation. Improved Decision Making: We can help you build coherent transition plans, comparing and prioritizing specific action items. Executives can foresee the impact of their decisions and plan the right actions at the right time to manage business transformation. With our solutions, you achieve greater agility and reactivity to overcome new business challenges. We have the data, tools and capabilities to help. Accelerate change programs and position teams to realize business benefits faster. Enterprise architecture is an enabler to your organization’s vision – ideally flexible, scalable and agile to adapt to changing requirements. If you are constrained by the inelegance of your IT landscape, established processes and operations, you can embark on an EA program to transform it, piece by piece. Our consultants will guide you every step of the way till your business is optimized and future-ready. At ECI our EA consultants are committed to the success of your initiatives. We emphasize on customized knowledge-based EA solutions for enterprise process and technology landscapes that fits your business needs. Providing a roadmap whereby both business and IT can fuel each other’s strategies. 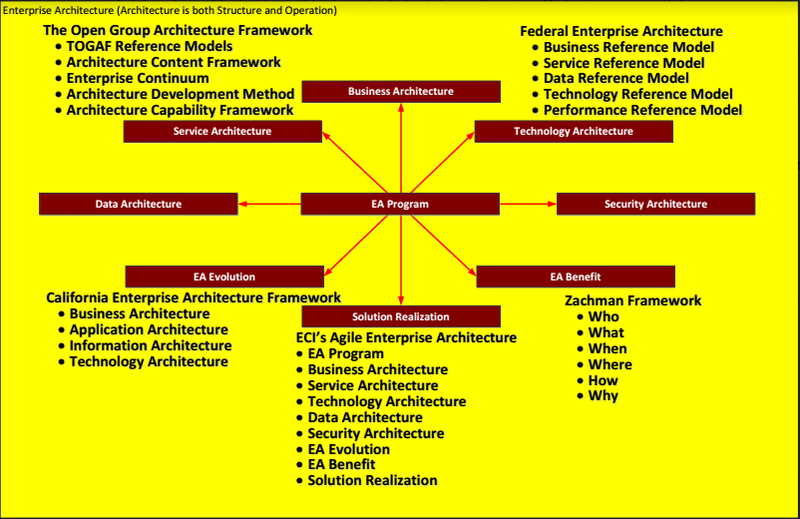 ECI’s approach to Enterprise Architecture is flexible and customizable. While we suggest our comprehensive EA model based on best practices and industry standard frameworks, we are flexible to meet your organization need. An ECI account manager directs each engagement and on-site consultants, ensuring high standards for quality and acting as a conduit between your business and the collective knowledge of our ECI family. ECI selectively recruits, and develops employees with strong interpersonal skills to complement their solid business and technical acumen. Our consultants receive ongoing education through our professional development program, and attending industry conferences and training to keep current on evolving best practices. Nearly all our EA consultants are TOGAF EA certified and knowledgeable in California Enterprise Architecture (CEAF) as well as Federal Enterprise Architecture (FEAF) Frameworks. ECI has invested nearly two decades in developing a robust Enterprise Architecture Center of Excellence to foster knowledge sharing for modeling and executing business outcome-driven EA practice using best practices techniques, methodologies, and processes. Our end objective is to help you model and implement flexible, changeable, and reusable assets. In addition to our knowledge base, we have dedicated teams of subject matter experts in Solution, Business, Application and Data Architectures, Analysts, and Program Managers whose collective intelligence are yet another way for ECI clients to tap into our rich resources and hundreds of years of combined experience in Enterprise Architecture practice. Continuous training and education is an integral part of ECI business and supported by our Professional Development Program for consultants so they continuously keep current on evolving EA frameworks, best practices, methodologies, tools and platforms. All of these components ensure that when you work with ECI, you don’t just get individual consultants, you get the support of the entire ECI team with access to proven tools, frameworks, and methodologies. By implementing our industry-specific enterprise architecture services—tailored to support each client needs—many organizations were able to significantly reduce their direct information technology costs, while gaining additional savings from cost avoidance and risk reduction. Greater value for your businesses: Our enterprise architecture solutions can consolidate several different views of your organization so you can respond more quickly and deliver greater value to your businesses. The strategy and business organization views shed light on your ability to execute. The information view is essential for understanding how workflows and dependencies should be adapted both inside and outside your organization. The IT view indicates how your information system should change to meet business needs. And the risk and control view lets you factor in your company’s risk appetite and investment capacity. ECI provides Enterprise Architecture that support business outcomes, accelerated by our enterprise architecture methodology to minimize duplication of effort and accelerate time to value. With our enterprise architecture solutions, your enterprise architects and business stakeholders can ensure that IT governance is a proactive component of your overall enterprise governance – which is critical at times of business model disruptions. Our website only includes samples of EA services we provide. We offer many other EA domain-specific services as well. To find out more about our EA services contact us and talk to one of our EA experts. We help our clients to substantially reduce and control their IT equipment costs. We help you make better decision, mitigate risks, and improve your inventory control through standardization, proper documentation and loss detection.